Fyfe, Richard W.. "Eagle". The Canadian Encyclopedia, 01 August 2018, Historica Canada. https://www.thecanadianencyclopedia.ca/en/article/eagle. Accessed 23 April 2019. A large bird of prey, the eagle (family Accipitridae) has exceptionally keen vision, long, powerful wings, a hooked bill and strong feet with sharp curved talons. The golden eagle has a variable habitat, from mountains and foothills to prairie and sea cliffs (Corel Professional Photos). Bald eagle on Vancouver Island (photo by Stephen Krasemann). A large bird of prey, the eagle (family Accipitridae) has exceptionally keen vision, long, powerful wings, a hooked bill and strong feet with sharp curved talons. 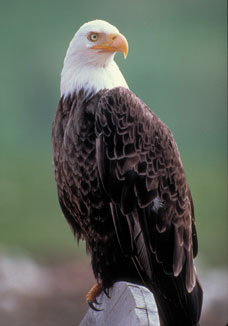 Eagles are fierce predators, spotting their animal prey as they soar or from their perches, and then swooping to kill. The more than 50 species of eagles are found on all continents and are divided into 4 major groups: the mainly tropical snake eagles and harpy eagles, not found in Canada; fish eagles, represented in Canada by the bald eagle (Haliaeetus leucocephalus); and booted eagles, including the golden eagle (Aquila chrysaetos), which breeds in mountainous regions of Canada, except on the arctic islands. 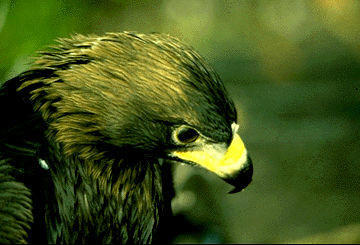 Bald and golden eagles are immediately recognizable by their large size and 1.8 m wingspan. As adults, the 2 are easily distinguished: the bald eagle has a white head (not truly bald) and tail, contrasting with the solid brown of the golden eagle, and the golden eagle has legs feathered to the talons. 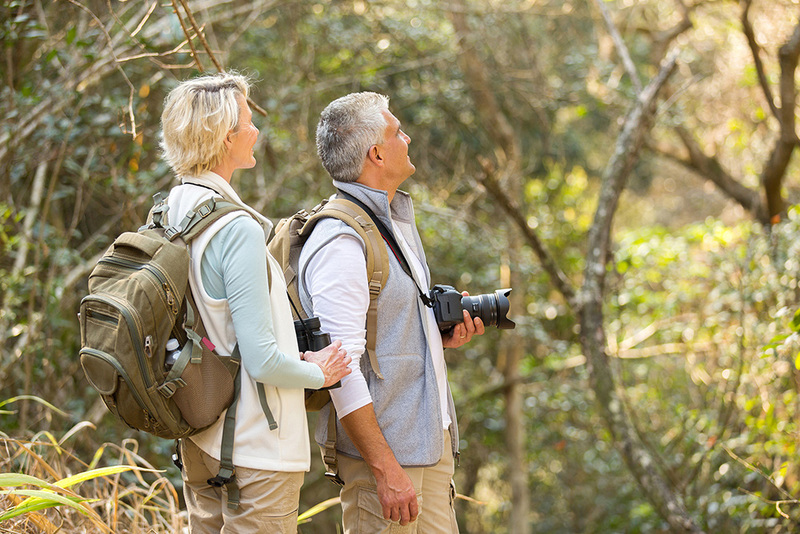 Bald and golden eagles nest in treetops or cliff ledges. Nests are made of sticks lined with grasses, weeds, etc. Because nests can be used for years, they can become enormous. Usually, 2 eggs are laid (range 1-3). Golden eagles incubate eggs for 43 days; bald eagles, 35 days. Young are down-covered and remain helpless in the nest for 50-100 days. The feathers of an eagle were of great symbolic value to the Native People of the Plains, signifying bravery or holding the power of spirits.